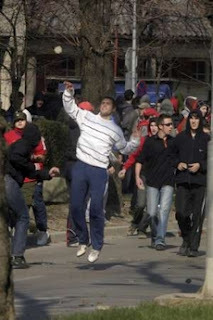 Hundreds of Serbian protesters tried to attack the US Consulate in Banja Luka today. Charles Johnson reported on the latest Balkan attacks on the US. Hundreds of protesters tried to attack the United States consulate in Bosnia’s Serb Republic on Tuesday, smashing shops in the city centre after they were pushed away by riot police. About 10,000 people protested in the region’s capital Banja Luka in a largely peaceful march against the secession of Kosovo from Serbia. The Albanian-majority breakaway province declared independence on February 17 with Western backing. But despite a heavy police presence, the protest turned violent when several hundred set off towards the U.S. consulate, throwing stones and firecrackers at the building. They also smashed the windows of Croat-owned shops in the centre of town. Three people were injured, including two police officers, the emergency services said. A Reuters witness on the scene said several rioters, mainly minors, were detained. Bosnia is made up of the Serb Republic and the Muslim-Croat federation, a dual-entity state created by the Dayton accords that ended the 1992-95 war among Bosnian Serbs, Croats and Muslims. 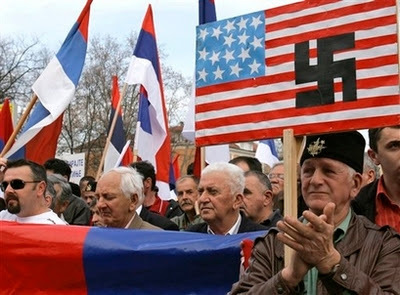 Meanwhile… Russia Today is reporting that the Serbs in Kosovo are rejecting a call to integrate. And… The Serbs in Bosnia are threatening their own independence.